I know it’s been a couple of weeks since I posted here, but the truth of the matter is, I haven’t had all that much to post about. I’ve been writing my way through the novella Crazy Larry until recently, with the word count so far coming in at around 15K. I still feel like it’s going to be a little shorter than The Road to Rejas, but I’ll just have to see where the story takes me. Maybe I can combine the two and publish a printed version of both novellas in a single volume. For that matter, maybe it will be time to do an omnibus of all the titles in the Half Past Midnight universe. Something for me to ponder when I get some time. In the meantime, I recently got back the first round of edits for Pangaea – Exiles from the publisher. So far, it looks like the comma and I are not going to be close friends. I seem to put them where they aren’t needed, and leave them out where they are. And there are also a lot of minor (to me) formatting issues. One that I see quite a bit of on this pass is an apostrophe that curls left rather than right. I’m not sure what the difference is, and quite honestly, I didn’t even know there were two kinds, but evidently I used the wrong one A LOT! :-? There are also a few spots where the editor is asking questions that I thought I had already explained earlier in the manuscript. The fact that she is asking the questions tells me that I may need to do some clarification. So I’ve written extra bits that should do just that, with notes to the editor to see if the new parts are needed, or if she simply missed the earlier parts. I guess that will all come out in the second round of edits. At any rate, I hope to have this round done later today and will be back to Crazy Larry for a short time while the editor goes over the returned manuscript. ITMT, I still have to see what they end up with for a cover design, so we’re not quite ready yet. Soon though, I hope. RPotW – And here’s this week’s random pic. It’s a simple “Harvest of the Day” picture. 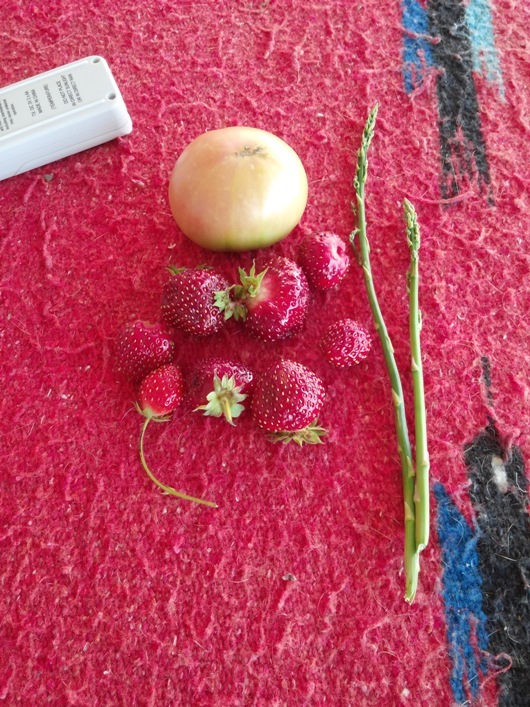 It’s not much… a single tomato, two little asparagus spears, and a handful of strawberries. I haven’t posted very many of these pics this year, mainly because my garden is really doing poorly this time around. I waited until much too late in the season to get things started. On top of that, all of the pepper seedlings I tried to start were duds. Not a single plant started. If not for the two plants I bought at the store, we wouldn’t have any peppers at all this year. I can only assume I used some bad soil. This will be the second year in a row that bad potting soil has bitten me. I’ll just have to accept that no matter how small the batch I’m going to be planting, I can’t skimp by using a no-name bag of potting soil. I suppose it’s just like anything else in life… you have to start with quality if you want to get quality. So here’s hoping you get great quality out of your life. Stay safe, and I’ll talk to you next time.